Why does Susan Rains give special attention to aging in place design? When I first started my business, I was a new mother. I was so in love with my little boy that I immersed myself in all things, baby. When I decided to start my own interior design business, I chose to focus on designing nurseries. It seemed like a perfect fit, but the projects I was asked to do were not usually nurseries. At the same time, I was learning a lot about business, and the question, “what is your why” came up repeatedly. Your “why” drives you and it’s probably not money. Reflecting on my “why” guided me back to the reason I studied interior design in the first place and that’s how I’ve come to return my design attention to the needs of people age 55 plus. You may be wondering why I’m interested in the changing lifestyle of someone 55 plus. First, I'd say I'm an old soul. But in all seriousness, I've personally dealt with the struggles of seeing people close to me lose their memory due to dementia and Alzheimers, the challenges of different physical handicaps and mobility issues along with the problematic choices children of aging parents have to make. My “why” has been shaped by meaningful relationships with people older than me. Starting, with the fact that I’m the daughter of an “older mother” and my brothers are 18 and 20 years older than me. I’m the only one of my generation in my whole family. One of my dearest friends was also my coworker. We bonded over art, music and a love for bar food. He was a colorful soul, generous to a fault and I did everything I could to help him as he battled with and lost his war on cancer. My grandfather had Alzheimer’s and lived with us for two years. He had the best hunting stories and bolo ties. When he was alone for the day he would leave the stove on and burn his soup to a crust in the bottom of the saucepan. A close friend’s mother who uses a wheelchair is one of the sweetest and smartest women I've ever known. She could never seem to reach what she needed and had a hard time navigating tight aisles in clothing stores. My Aunt was an avid painter of birds and landscapes, she made me great shrimp salads. She had Alzheimer’s and succumbed very quickly. I had a summer job at an Adult Day Center. There was a woman with dementia who wore a sparkly pink beret and called me daughter. I adored her and looked forward to her arrival every day. My mother now seems to be going through progressive memory loss and mobility issues. She loves telling stories about her world travels but when things get a little twisted and you ask her about it, she’ll deny any discrepancy. I can only say that because she will never read this. When I've been in the company of friends and family who are experiencing different challenges, one of the most noticeable things is that simple tasks around the house become more difficult. Things I take for granted like getting a box of cereal down from a high shelf. Things that can become so annoyingly difficult that they give up, don’t eat or chose to eat something they didn’t want in the first place. When I left their company, I worried about them. What if they fell down or didn’t eat enough and lost too much weight? Until I went to school for Interior Design and then continued to study aging in place, I didn't know how these things could be made simpler with modifications that bring back the convenience of being at home. We all deserve a home that loves us back. My first career was a custom picture framer. I enjoyed the work, and it was a position I was able to grow with and advance to the point of doing everything there is to do in a framing studio minus being the owner. After ten years, I found myself wanting more from my nine-to-five and frustrated with my side hustle as an artist. Neither one allowed me the lifestyle I wanted. Especially, as I got into my late twenties and realized just how much I wanted to get married and have a child. I started looking into any and all the creative careers I could find. I paid a visit to several colleges and weighted my options for career flexibility, creativity, and earning potential. Then came an unexpected turning point. I offered to deliver a completed frame job to my neighbor, Lifecycle WomanCare (formerly the Birth Center in Bryn Mawr). A nurse-midwife greeted me at the door and invited me in for a tour of the birth suites. It was a healthcare facility like I had never seen before. It was not cold or sterile but warm and like someone’s home with real furniture, artwork, and bedding. I loved the unique touches like large tubs for mothers to labor in, warming drawers for baby blankets and clothing along with a living room and kitchen for the family to wait for their newest family member to arrive. The light bulb went off. I didn’t even know healthcare design was a thing, but now I was inspired, and I knew what I wanted to study, interior design with a focus on health and well being. When I was at Drexel, I took every opportunity to incorporate accessibility and aging in place elements into the design. When my thesis year arrived, I chose to study Alzheimer’s disease and the therapeutic effects of light and nature. I then designed an adult day center that included a lot of exposure to natural light, views of nature and access to the usual things of life like a garden to plant flowers and a kitchen where members could make their own breakfast if they wanted to. 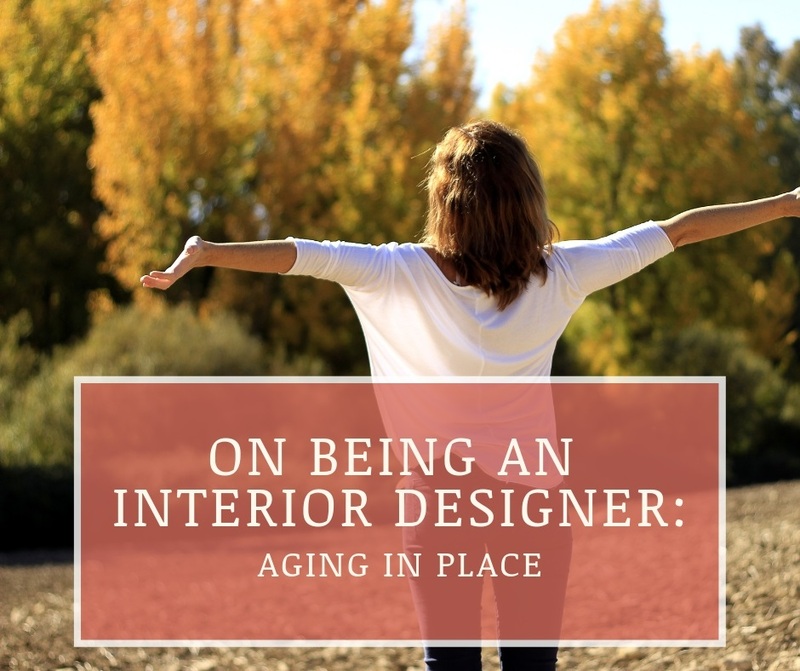 Interior design with a focus on aging in place is the perfect mix of the creative and tactile parts of design I enjoy so much, and the meaningful aspects of design that mean so much more to me. I can help make people’s lives more comfortable, safer and more enjoyable. It’s my way of giving back with my talents, skills, and passion to the community of people I enjoy being with and helping the most. As an interior designer with a particular focus on the needs of people 55 plus, I see a lot of value in making the investment in a home that is easier to live in now, and allows people to be a bit more ready for the future. Our lifespans are on the rise, people are now expected to live into their 80's and 90's. By anticipating our changing lifestyles and taking measures to adapt our homes we can reduce the worry over the unforeseen things that may happen. Aging in place, as it's known, creates a place where everyone can enjoy your home. You are making it more accessible, safe and comfortable for everyone, so you can enjoy it for years to come. That includes friends, family, and children of all ages. When I first started my business I wanted to create a beautiful and safe place for babies to grow up in. Now that I’ve reconnected with my “why”, I help create homes that improve peoples health and well being, while celebrating who you have grown up to be. No matter what kind or amount of help you might need my focus is on your changing lifestyle. Let’s prepare for the future with style and confidence.